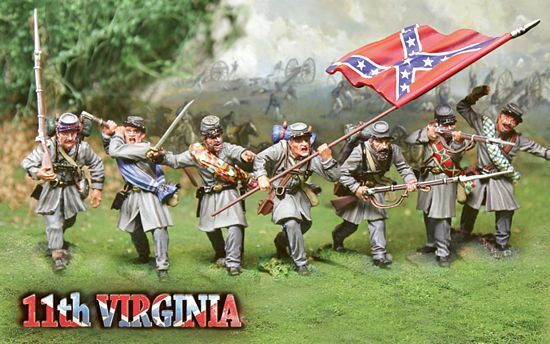 The 11th Virginia Volunteer Infantry Regiment was raised in Virginia. It fought mostly with the Army of Northern Virginia. The unit fought at First Manassas in a brigade under James Longstreet and at Dranesville under J.E.B. Stuart. Later it was assigned to General A.P. Hill's, Kemper's, and W.R. Terry's Brigade, Army of Northern Virginia. It served with the army from Williamsburg to Gettysburg except when it was at Suffolk with Longstreet. The 11th was engaged at Plymouth in North Carolina and after returning to Virginia saw action at Drewry's Bluff and Cold Harbor. It went on to fight in the Petersburg trenches south and north of the James River and ended the war at Appomattox.